1. The sinking of the RMS Titanic in the Atlantic Ocean with the loss of over 1,500 lives. 2. The birth of Leonardo da Vinci - a man who left a legacy of incomparable genuis that the world still admires 500 years after his time. So what's the ice cream connection? In the case of RMS Titanic, ice cream was on the menu for first and second class passengers on the last day the ship ever saw daylight - April 14 1912. Described as 'French Ice Cream' for first class diners and as 'American Ice Cream' for second class, this alone portrayed vividly the class distinction that existed at the time. Read my Titanic Ice Cream blog post from 2008 for more details and links to see scans of the menus. In the case of Leonardo da Vinci, well as much as he was a brilliant inventor, one thing he did not come up with was a design for an ice cream maker! No, my ice cream connection with him is much simpler. 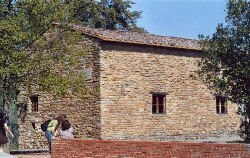 I have been fortunate enough to visit Vinci in Tuscany where Leonardo's family came from and, indeed, to visit the house in Anchiano where Leonardo was born just up the hill from Vinci. It was the most beautiful sunny day and the carpet of red poppies that lined the hillside as we drove up to it was a sight I will never forget. Returning back down the hill to Vinci once more, we stopped for coffee and ice cream at a small cafe near the museum. For some reason, that ice cream tasted more delicious than any I had had for a long time and whenever I think of Leonardo's birthplace that is one of the memories that comes to mind. If you ever get the chance to go to Tuscany it is the most wonderful place - whether you like ice cream or not!